“Tallgrass Communities” – also known as Tallgrass Prairies and Savannas are natural grasslands with a great diversity of native plants and animal life including a fascinating diversity of butterflies and night-flying moths. All butterfly and moth species incorporate ‘host plants’ in their lifecycle. Without a host plant the butterfly could not exist. The host plant provides nourishment and resources to the developing larva before it forms a chrysalis on its final path to adulthood. 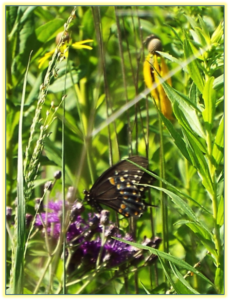 Tallgrass communities contain many species of native plants – forbs and grasses that provide host plant services (larva food) to moths and butterflies as well as nectar (food) sources. Prairie plants such as Rough Blazing Star are nectar magnets for many kinds of butterflies. Milkweeds, another native plant found in prairies are the host plant for the mysterious and beautiful Monarch butterfly. 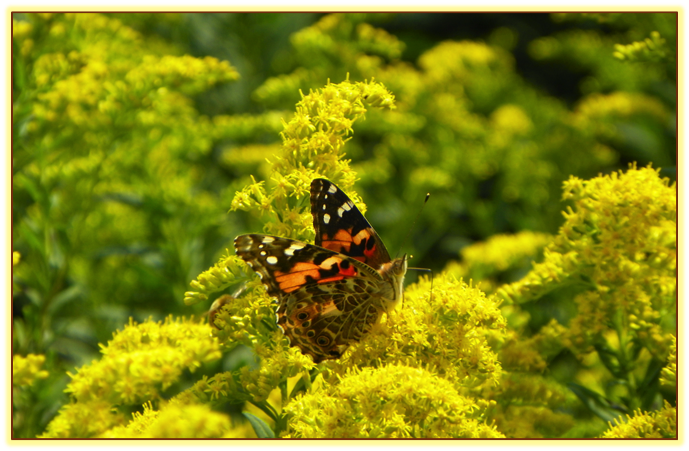 Dozens of butterfly species are associated with Tallgrass Prairie. Pollination is a vital process in the life cycle of all flowering plants. It happens when pollen grains are exchanged between two flowers of the same species. This can occur by wind, water or animals. Successful pollination results in the production of healthy fruit and fertile seeds, allowing plants to reproduce. No prairie ecosystem is complete without the Bumblebee. 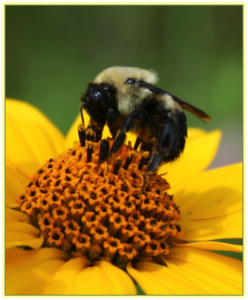 Bumblebees are important pollinators and are essential to the reproduction of many prairie plants. A decline in the population of Bumblebees means less opportunity for plants to exchange genetic information resulting in reduced reproductive success. Bumblebees are members of the bee genus Bombus. There are over 250 known Bombus species existing primarily in the Northern Hemisphere. More than a dozen species are found in Southern Ontario. Bumblebees are considered to be true social insects because they nest communally and they share division of labour. For Bumblebees this is known as a “eusocial” colony. Eusociality is an extreme form of “kin selection” which is an evolutionary strategy which favours the reproductive success of an organism’s relatives, even at a cost to their individual survival and/or reproduction. Bumblebee nests are constructed in the spring after the over-wintering queen emerges from hibernation. Her first task is to collect pollen and nectar from flowers and she then searches for a suitable nest site. The types of nest location vary among Bumblebee species. Some species prefer to construct nests in holes which lead underground while other species prefer tussock bunch grass or directly on the ground. Bumblebee nesting colonies are not as large as honey bee hives. This is because of the small physical size of the nest cavity and a single female being responsible for the initial construction and reproduction that happens within the nest. Also, in many Bombus species the colony is limited to a single season. Often, mature Bumblebee nests will hold less than 50 bees. Some Bumblebees will build a wax canopy or “involucrum” on top of their nest for insulation and protection. Bumblebees rarely preserve their nests over the winter. Bumblebees are not aggressive like honey bees. They will not attack a human unless they are threatened. When a Bumblebee comes close don’t wave your arms widely but stand still. Under the right lighting conditions Bumblebees are attracted by brightly coloured clothing. Once the bee confirms that you are not a flower it will move away from you. If a Bumblebee is forced to use its stinger for self-preservation they do not die like the honey bee. One of the biggest threats to the Bumblebee is a human armed with a spray can of insecticide or a fly swatter. Bumblebees are excellent pollinators of gardens and vegetable crops so they should always be encouraged in the garden and on the farm. They are major pollinators of cash crop tomatoes. Some plants can only be pollinated by Bumblebees because the plant anthers release pollen internally. The pollen must be shaken loose by buzz pollination or “sonication”. Bumble bees are the only animals that perform this behavior. Bumblebees sonicate but European honeybees do not. If Bumblebees disappear the plants that rely on them will suffer genetic degradation leading to population decline. As habitat decline marches across the landscape pollinator strips and pocket Tallgrass Prairie could become a crucial tool for the conservation of many pollinating insects. Pollinator Habitat is diminished by the wide-spread use of herbicides in agriculture and roadside management and further degraded when rural hedgerows are removed to make larger fields. These impacts can be offset by employing pollinator strips as a road-side management tool and alongside municipal drainage right-of-way’s and on farms. Public land managers and land owners can play a big role in reversing the decline of pollinator habitat. Pollinator strips and pocket prairies are created by using a high diversity seed mix containing many different native flowering plant and grass species. hind segment of the abdomen. Beltsville, Maryland, USA CC BY 2.0. Over the past 2 decades there has been a general decline of pollinating insects in many ecosystems around the world. It is speculated this phenomenon maybe related to the decline in the populations of many song-bird and aerial-insectivore bird species. Bumblebee experts at York University have been tracking formerly common species of Bumblebee in eastern North America. Field surveys in Southern Ontario completed between 2004 and 2006 and again more recently were compared with surveys completed in the early 1970s from the same areas. Only 11 species were found, down from 14, and of those 11, four were in decline. What is most alarming to entomologists is that the Rusty-patched bumblebee Bombus affinis which was one of the most common Bumblebees in fields, farms and gardens in Ontario is among the missing. Bombus affinis was a common visitor to many different kinds of plants. Some of these plants play important economic or ecological roles. The Rusty-patched bumblebee has disappeared from about 90 per cent of its range in the past 20 years. It was added to the list of Ontario Species at Risk in 2007. In 2017 it became the first officially endangered bee species in the continental U.S and in 2018 it is facing imminent extirpation or extinction in Ontario. In Ontario, until recently this Bumblebee played a crucial role as a pollinator of crops and wild plants. The cause of decline in the native Bumblebee population appears to be a combination of factors. Most cited reasons include loss of habitat, imported disease, widespread use of insecticide in forestry and agriculture and climate change in which bees emerge from hibernation out of sync with the flowers they rely on. The homeowner can help Bumblebees by going pesticide-free in the garden and planting native flowering plants that Bumblebees prefer. Bumblebees have a preference for native flowers and plants, more so than garden flowers that have been imported from other regions or continents. Farmers and roadside managers can employ pollinator strips to increase local pollinator habitat. Contact Tallgrass Ontario Email: info@tallgrassontario.org for more information.